Raz's Midnight Macabre: Welcome To The Show Trading Cards - Sideshow Needs Your Help! 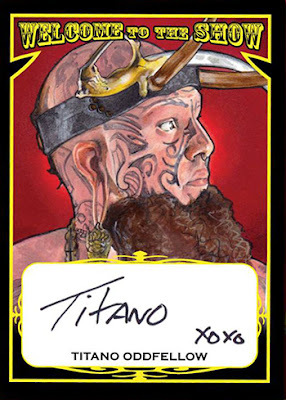 Welcome To The Show Trading Cards - Sideshow Needs Your Help! Internationally acclaimed trading card artist Mike James releases his first independent and self-produced trading card set "Welcome to the Show - Series 1: Sideshow". This set features 20 legendary modern sideshow artists that have been featured in Guinness World Records, Ripley's: Believe It or Not, and numerous television appearances across the globe. With performers from America, Canada, Australia, the United Kingdom, Finland and more, this set is a truly one of a kind global showcase. I really do wish I had the cash for this set, it looks stunning and for those of you familiar with my work will know how big a fan I am of the sideshows. So do you want to get involved? Then head on over to the IndiGoGo page HERE and see how you can help out!